In September the Polish cabinet approved a law that will punish (including imprisonment) anyone claiming that Poles killed Jews during the Second World War or referring to concentration camps like Auschwitz as “Polish.” The legislation was met with widespread criticism; the Polish ambassador to Israel defended the law in the Israeli newspaper Haaretz. All of it, however, missed an important point. What’s so egregiously offensive about this law is its assault on storytelling. The government supporting the law, led by the far-right, nationalist, anti-abortion, anti-LGBTQ, and eurosceptic Law and Justice Party, has spent the year since its election sparking international condemnation for refusing to accept refugees, purging the ranks of the police and intelligence services, passing laws that inhibit the power of the judiciary, and dismissing inconvenient public broadcasting directors. In February President Andrzej Duda announced his intention to revoke national honors bestowed on a Jan Tomasz Gross, a Polish historian who researched Polish complicity in the Holocaust. In July, Law and Justice’s education minister, Anna Zalewska, denied outright the well-documented participation of Polish citizens in Poland’s two most infamous pogroms against Jews. Based on all of that anti-democratic flag-waving as well as the previous attempts at repackaging Holocaust history, it’s fair to assume that the new law is designed to whitewash the story of wartime Poland and as a sword of Damocles hanging over free speech, to “block attempts to reveal the truth about the murder of Jews by Poles during the Holocaust,” as Daniel Blatman wrote in Haaretz. The Polish government is not alone; all communities and nations tell stories about themselves in order to create meaning. Indeed, all of history is a form of storytelling, “not a monument erected once and admired ever after, but an infrastructure tended,” as Rokhl Kafrissen wrote in Haaretz, “…inevitably shaped by those who take it up.” Even renowned Holocaust historian Raul Hilberg, after writing his magnum opus, The Destruction of the European Jews, admitted that storytelling and poetry were tools to convey horrors that evaded normal language. I can express exactly why the Polish law is so offensive by telling my own story. 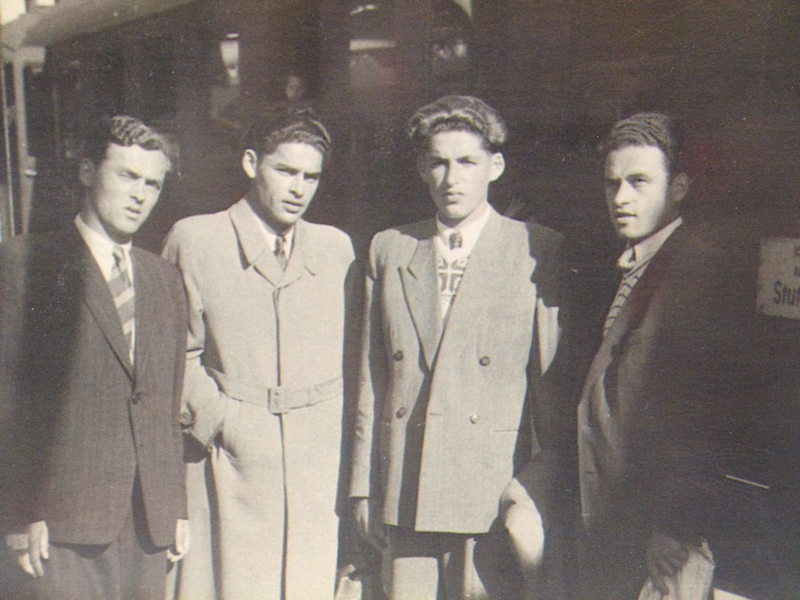 My grandfather, Joseph Sarna, one of six brothers, was born in 1921, to a simple, hardworking family in Działoszyce, a small town located an hour’s drive north of Krakow. Działoszyce was home to a Jewish majority (80%), making it a rich albeit small oasis of Jewish life, whose humble landscape was punctuated by a majestic synagogue, the skeleton of which still stands today. When the Nazis arrived in Działoszyce in September 1939, my grandfather fled, was arrested, and spent the war in concentration camps. After liberation, his brothers returned to Działoszyce to find any surviving family. They were greeted, on the night of June 16, 1945, with the sound of gunfire and grenade explosions, as local Poles killed five Jewish returnees and injured dozens more. My family survived by hiding and fleeing their home a second time. Much worse episodes occurred across Poland during and after the war. 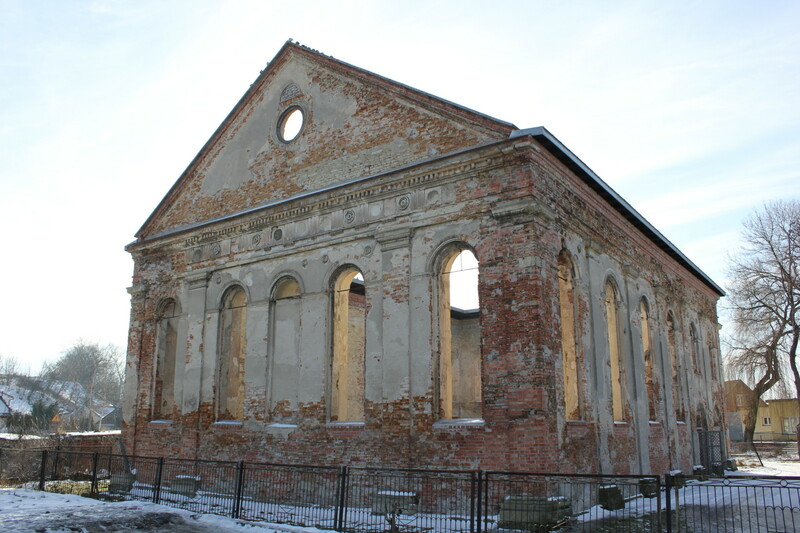 In 1941, in the town of Jedwabne, 340 Polish Jews were rounded up by their Polish neighbors, in coordination with the German Ordnungspolizei, and burned to death in a barn. In 1946 Polish soldiers, policemen and civilians killed 42 Holocaust-survivor Jews in the city of Kielce. 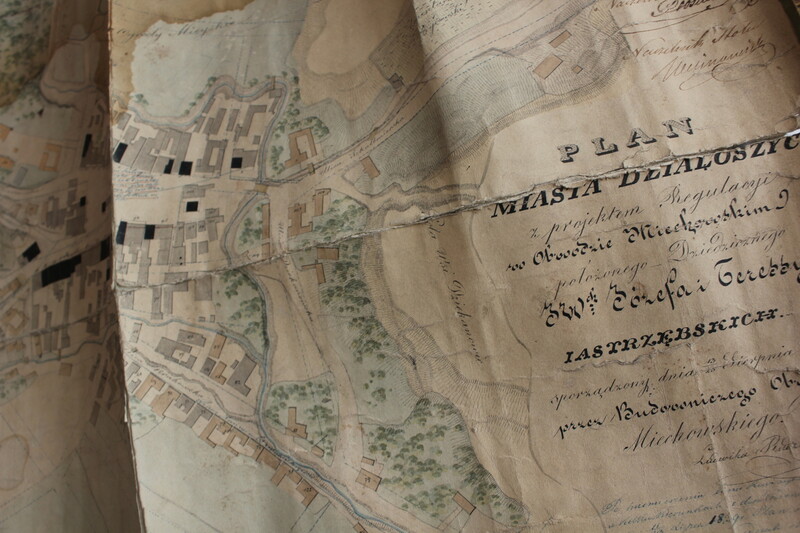 In January of 2014 I went to Poland to see my family’s hometown and search local archives. I was undaunted by the winter and opposition of my family. “HOW long are you staying there? !” asked my mother, as if it was inconceivable that anyone would want to spend more time in Poland than they would in a freezing shower. I rented an apartment in Krakow’s old Jewish neighborhood for two weeks; I wound up staying for more than a month. I was doomed to be spellbound: raised on nostalgic stories of life before the deluge and my grandfather’s inexplicable survival in Krakow’s Płaszów Concentration Camp, made famous in Schindler’s List.”I was walking with ghosts in a postcard-pretty landscape that, 70 years earlier, had been my family’s crucible. It felt like cheating, but I loved Krakow. I must’ve visited every church and museum. I procrastinated away whole afternoons beside the fireplace of an antique-stuffed cafe that hadn’t changed since 1939. I discovered the most sublime plum cake I’d ever eaten at a tiny bakery on Dominikańska Street. I didn’t mind the ankle-deep snow; it was an Instagram blessing. I sort of fell in love with Paweł, a blond, blue-eyed hipster from a small village, working hard to make ends meet while getting a master’s degree and dreaming of a career in art. He and his friends were of a generation of Polish millennials who post photos of artisanal baked goods to social media, devour H&M and Zara clothing, and laugh about Poland’s obsolete reputation as a dusty post-Communist backwater. When it came to anti-Semitism, what I found in Poland was surprising: I didn’t really find it. What I did find was the Krakow Jewish Center, where a busy schedule of events is a heartbeat of Jewish culture, raising awareness of the city’s Jewish heritage to its non-Jewish residents. In Warsaw I visited the Smithsonian-worthy POLIN Museum of the History of the Polish Jews, fresh out of the plastic. I became friends with Michał Pirog, a gay, Jewish, prime-time television host whose tremendous popularity proved changing attitudes. In Działoszyce I was warmly welcomed by the mayor’s office and a local historian, who spent time showing me his research. I watched contemporary Polish films like Poklosie, Ida, and Demon, which raise questions about Poland’s destroyed Jewish heritage, wartime crimes, and culpability. I attended concerts and lectures at both the Warsaw and Krakow Jewish Festivals. There were some rotten apples, however, in the bunch. I became the pitiful protagonist of a cliché when I had the door of my grandfather’s childhood home slammed in my face by its current resident. One morning I found “Jebac Zydow” (f#@k the Jews), a gem of anti-Semitic Polish football jargon that doesn’t actually refer to Jews, spray-painted on my apartment building. I stumbled upon mock-folk-art wooden dolls depicting Jews with money bags, for sale as good-luck souvenirs. In Sandomierz’ medieval cathedral I saw Karol de Prevot’s 1708 painting depicting the Jewish ritual murder of Christian babies, still hanging. It was especially awkward when in Warsaw, a friend-of-a-friend, after learning that I was Jewish, enthusiastically told me she lived in her grandparents’ old apartment, which had been confiscated from Jews forcibly relocated to the ghetto in 1940. But only because I subsequently spent a lot of time in Poland is it clear to me that what’s most ridiculous about Poland’s revisionist legislation is that it does not reflect the opinion or will of a huge portion of Poles. Is there a strain of antiquated, latent insensitivity toward Jews? Yes. But the scars, questions, and vacuum left by the Jewish absence in contemporary Polish life are subjects for cultural consumption. And, quite honestly, the cat of admission is already out of the bag. Polish intellectuals like Jan Tomasz Gross, Anna Bikont, and Jan Błoński have already researched the facts of Polish wartime wrongdoing, young people are taking interest in Polish-Jewish heritage, and Polish presidents, like Bronisław Komorowski and Aleksander Kwaśniewski, have repeatedly apologized for Polish wartime wrongdoing. It’s essential to mention that that my family has another indispensable story: my aunt’s mother was, like thousands of Jews, saved by a courageous Polish family during the Holocaust. The sacred cow of Polish victimhood that chokes competing narratives is understandable from a sociological perspective; no other country in Nazi-occupied Europe suffered like Poland. And right-wing Polish politicians are right: it was the Nazis who erected the barbed-wire fences of Auschwitz. But there was a whole country surrounding those fences, fertile with age-old institutionalized and folk anti-Semitism that allowed for a culture of schadenfreude and exploitation. There were no Germans left in Działoszyce when shots were fired in June 1945. Nor was it a German who, scared silly by rumors of Jewish real-estate revenge, slammed his front door on me in 2014. But instead of nobly exploring complex parallel narratives of heroism and injustice that Poland’s millennials are ready to digest, Poland’s new law rewrites history to massage the national ego, spits in the face of stories like my grandfather’s, and cripples the pen of young Poles and Jews who are ready write their own, new chapter about Poland, its complicated history, handsome blond guys, and plum cake. David Sarna Galdi is a freelance journalist and former editor at Haaretz newspaper. He works for a nonprofit organization in Tel Aviv. A version of this article originally appeared in the 121st print edition of The Krakow Post. Many valid points and I agree that legislation in this field is counter-productive and smacks of a kind of siege mentality. We are witnessing an attitude among some in the ultra-nationalist camp which refuses to accept that even a people so brutally treated as the Poles could include among their number individuals who were themselves brutal. I welcome the positive comments but there are however, one or two things in the above article I would question. For instance, ” A whole country surrounding those fences….allowed for a culture of schadenfreude and exploitation” writes Mr Galdi. A whole country? Isn’t this simply a generalization about the Poles? The “whole country” did include people like the Ulmas, after all. There were no doubt extremes in Poland: the self-sacrificing individuals who risked their lives (and often lost them) trying to save their Jewish friends and neighbours, as well as the brutes, motivated by sheer, unadulterated anti-Semitism who were glad of the opportunity to harm the Jews. In between, there were those Poles, arguably the vast majority, who were themselves brutalized by both the occupying Nazis and Soviets and whose only concern was their own survival. On the point of generalizing about Polish people, it might be worth mentioning here an article which appeared elsewhere and which recently pointed up the contrast between wartime Poland and Holland, suggesting that the number of Polish Righteous in relation to the overall population compared unfavourably to that of the Netherlands. Here the question presents itself: were the Dutch threatened with the death penalty for harbouring Jews? Context is everything. The complexity of history is manifold and will only be known in a truly unbiased form many years from now as hitherto unknown and unacknowledged episodes see the light of day. If a historian slanders an individual by name, based on a misreading of history – as happened recently in the case of article in the UK about General Wladyslaw Sikorski – then he or she must be prepared to face the consequences, but a historian who can provide irrefutable evidence for his or her assertions should not have to be intimidated by threats of legal action. You may disagree with Jan T. Gross, but threatening to prosecute him is already self-defeating, since, whatever the validity or otherwise of his claims, most independent commentators will sympathize with him and not with a government which is seen to be challenging him on the basis of their own tendentious reading of history. My previous comment got lost in the ether somehow, but what I’d say is that I’m with Mr Galdi about the wooden figurines – for sale at the Sukiennice, for instance. In fact, if I were in charge of Poland (instead of Mr Kaczynski or whoever it is who is actually running things right now), I’d start with getting rid of those. However, as a reciprocal gesture, it might be good if some wise old heads in the USA were to concede that Spiegelman’s pigs are equally offensive and should be withdrawn from classrooms as a primer for Holocaust studies. They ought to be reserved instead for serious study for people who already have a grasp of the basic issues. If we can avoid mutual stereotypes, then that would be a start. Dialogue is the only way forward. There was a time when the distinction “Poles” and “Jews” was not made. Zamenhof, for instance, was Polish. Maybe we can reclaim our common history. Wesolych Swiat. Wow, will Webster’s replace the definition of chutzpah with that quote? Thanks – don’t need foreigners telling Poles what Poland’s true story is – but thanks for trying. Now go home and leave us TF alone. “Us”? You have an unusually un-Polish name for a Polish person. No response? “Uli”, if I’m not mistaken, is a German name. What exactly makes you qualified to comment on Polish issues? You may agree or disagree with the author of the above article, but his grandfather was a Polish citizen. What’s your connection? Does a piece of paper belonging to your grandfather makes you “qualified” to have a discussion? Not sure I follow that. – he misrepresents the law – where in the law does it say that you cannot say that “Poles killed Jews”. Yes, Poles did kill Jews. And Jews killed Poles. Until left-wing Jews own up to the role their fellow travelers played – disproportionately – in the Communist secret police (not just in the Communist movement which could be forgiven) – not just in Poland but across the Soviet Union, Ukraine, Hungary, East Germany (remember Markus Wolf?) all the Polish self-reflection won’t be necessary and insistence on it will be perceived as rank hypocrisy. Please tell me why crimes committed by Polish murders are somehow representative of a “Polish wrongdoing” but when NKVD henchmen who were Jewish do something that is not “Jewish wrongdoing”? We can agree not to do that but we should not have to agree not to do that just to one group. No? And you can say both things, last I checked no one went to jail for saying that Poles killed Jews. No one mainstream disputes Kielce or Jedwabne. The question is rather a “so what” as to today’s Poland. Yes, we know what happened. How many perpetrators were there? Were they punished? If yes, then what do you want? Today’s Poles to feel bad because someone did something 70 years ago in a part of Poland in and in a time they were not even around at? – he claims that this is “an assault on storytelling”. But we have “assaults on story telling” all around us, no? Aren’t the various “incitement” laws or “hate speech” laws assaults on storytelling? Isn’t Holocaust denial also criminalized? It seems what bothers this person is not “assault on storytelling” but an assault on storytelling that may be deleterious to Poles. Other assaults on storytelling are “ok” and, perhaps, should even be encouraged. Instead, he makes this into a drama as if his grandfather were somehow silenced by the new Polish law such that he can’t tell his story even sitting in Haifa without looking around his shoulder for vicious PiS henchmen ready to pounce on him. Is PiS “far-right”? If so, what is the former League of Polish Families, Ruch Narodowy or ONR? The party is “nationalist” – really? Well, yes, duh, Poland is a nation state – it should have a nationalist party. Is Likud “nationalist”? Has the abortion law actually been changed? Does he think that killing babies is ok? Perhaps that is why “right wing” Jews will slowly take over Israel – the left just kills its offspring in the name of progress. I foresee declining sales for Haaretz to match the decline of Gazeta Wyborcza. What does it mean to be anti-LGBQT? Was he hounded in Poland for being gay? Does not wanting to legalize gay marriage already mean you are anti-LGBQT? Further, is this person FOR accepting Muslim refugees into Poland? What gives him the right to be for or against that? His grandfather’s piece of paper? Syrian refugees are much closer to Israel – why not send all of them there? Is he for that too? Why is “purging” the ranks of the secret police of people who spied on reporters and had a shady Communist past bad? As regards the Polish constitutional crisis, then last I checked it was the prior government that made an attempt at court packing. Putting aside that Polish courts are notoriously slow and mismanaged such that it seems a blessing for someone to actually want to tackle that. Does this person support the coup attempt that is currently under way? Public broadcasting directors serve… the public. If a government elected by… the public wants to change them they should be able to do so. These are not sacred cows with perpetual sinecures. Finally, what “international condemnation” has PiS really sparked? That of leftist commentators and of the German and EU establishment. One might also observe that if a “right-wing” Polish commentator started talking about “international” condemnation in this context, he would likely be accused of anti-Semitic insinuations. Not only are most Poles not “against” PiS but even those who were against it initially are increasingly becoming irritated with the “international” condemnation of Poland. What’s more, the international is not even that – the fact is that “ordinary” Germans, Frenchmen, Hungarians, Swedes and (as we can now see Americans) are not only not condemning Poles but, if they were asked, would likely express their support. – “The sacred cow of Polish victimhood” – Really? This VERY article is about “victimhood” and not Polish victimhood but his own. Does he not see that? – why is flag-waving “anti-democratic”? Does the color of the flag matter? – as regards Jan Tomasz Gross – why does the author feel the need to call him Polish? Presumably to strengthen his argument that EVEN POLES believe what he says. However, one might just as easily call Gross Jewish on his father’s side. It is likely that it was that side of his heritage that drew him to write falsehoods about Poles (Yes, Poles killed Jews in Jedwabne but no it was not 1200 victims but 300 – do numbers make a difference? Apparently so, otherwise Jews wouldn’t be arguing about whether it was 5.9m or 6m that were killed in the Holocaust). The outrage about Gross is not that he has to be stripped of his awards (which has not been done incidentally and likely won’t be so not sure why it’s even mentioned) but that he was given those awards in the first place. Finally, as for “Karol de Prevot’s 1708 painting depicting the Jewish ritual murder of Christian babies” – I suggest the author visit more places in Western Europe. I assure him that “Jews doing bad things to babies” is a frequent theme in the “artwork” of some very “civilized” parts of the continent. No one has suggested to “remove” that artwork (yet). I do not write this to convince this person – I sense he is too far gone. But maybe, at least, others reading it will have some self-reflection. And what is this blond/blue-eyed fetish? That sounds like some sort of a creepy gay Nazi theme. Lots of points raised in your reply, but – I’m not about to get into a discussion with you for the simple reason that your comments are directed towards the author of the article. But you didn’t actually answer my question, did you? If I were to write, for instance, a critique of the political system of Nepal, people might be inclined to take me more seriously if I could demonstrate some kind of Nepalese connection, even if it were just the fact that I had studied in Kathmandu. Its good to see a balanced view on the issue. As an expat Pole I am proud of my birth nations courage during the atrocities of World War 2. There were Poles that killed Jews in WW2, but many more saved Jews from the Germans and Russians. It is very unfair that many American Jews try to paint Poland as inherently Ant-Semitic whilst conveniently forgetting the attituded of Americans and the British towards the Jews during WW2. As for PiS, I sincerely hope that enough young and reasonable Poles vote at the next election and vote out PiS before it does any more damage to the nation. Speaking of “coming to terms with a complex past” in Poland, the attempt to totally discredit Walesa may ultimately backfire. Whatever his flaws, history is likely to judge him as someone who, whether he intended to or not, helped to bring about the total collapse of a rotten system. His subsequent administration ought to have put certain high-ranking Communists on trial, and these are legitimate question marks against him, but the current campaign against him smacks of a vindictiveness which reflects very poorly on the people conducting it. What an interesting article and comments! We were standing on the platform at Czestochowa in early October, 2016 waiting for the train to Krakow when I, a Canadian of Polish ancestry, was confronted by a man, a total stranger, who pointed to my facial structure and observed very loudly that I looked like a Jew. “Look at your nose, your jaw, you look like a Jew!” he exclaimed. Visions ran through my head of people being betrayed by their countrymen for some kind of reward or recognition by falsely recognizing a figure on a wanted poster drawn by a sick and prejudiced mind. Then to add to a supposed insult he added that I looked like I had had a very “fun” life. We had both visited Jasna Gora and we were of the same faith. Did he not remember that Mary, the mother of the son of our God, was also a Jew? I was absolutely flattered and edified and why not? But, at the same time I felt some of the fear of the people of Poland nearly 80 years ago. This man was a senior in his seventies, an American of Polish ancestry from Houston, Texas, discovering his roots as I was. He bragged about his wealth and success while I kept in my heart the pride I felt for my own relatives who were arrested and had to endure life in concentration camps as political prisoners. I felt the sadness in Kazimierz and in Auschwitz-Birkenau where the birds still do not sing. Yes, Poland has a complex past but sadly history repeats itself because of ignorance and a lack of grace. This is a beautiful country with gentle souls trying to trust and laugh again and I hope that it will be able to regain its sense of pride and worthiness on the world stage. I am a 75 year old native Texan from Austin. I just finished reading “Irena’s Children” and wanted to learn more about today’s Poland. I have traveled extensively globally but never to Poland. I want to apologize for the other Texan. We have enough problems in this world with people’s actions. We surely don’t need prejudices based on a person’s looks. second, the Nazis were notorious on using propaganda and demoralization, they spread a lot of misinformation to their own people and Poland, trying to convince the poles to work with them. third, after the war ended the Nazis didn’t simply puff out, like i said on my first statement, there were Nazis actively working to put Poland down again. and they had the help of the U.S. government, because their (U.S.) main objective at the time was to put the communists (Russians) down. and many of the actual communists were also anti Semite and anti Polish. Russians hunted poles like dogs after the war, Nazi high ranking officers and “doctors” were employed and spared by U.S., whole Nazi agencies were working together with U.S.
fourth, look at the map of Poland now, and compare to before. what do you see? you see it more to the West, right? it was Russia that decided to do that to Poland, they didn’t want to give their own land back to Poland, oh no. they had to take it from Germany. even with all those mass expelling of the German, it is bound to have a couple of them in Poland. remember, when the Nazis invaded Poland, they dressed and acted like Poles, they spread leaflets in the cities to cause public hysteria. the poles and Jews were lined up like sheep to their death, not knowing about the wars. misinformation and lack of information played a big part on this. wouldn’t you think those massive German state organized anti Jewish propagandist had at least some effect on the polish population? specially when they were betrayed and forgotten by Britain and U.S., left to rot with communism? fifth, this law is made to protect Poland as a whole against slanderous statements made by high profile people, it doesn’t include art of satire. and you are only going to jail if you don’t show evidence of your statements. this also doesn’t say no polish person ever had anything to do with the Nazis. it states that the Polish Government and community had nothing to do with it. during the second war, the polish government (in exile and underground) made it illegal to help the Nazis or betray the jewish community, if you were caught doing that or admit, you would be shot dead at the spot after trial (by the polish resistance). despite the fact the poles could have done that to save their own lives and their family lives. (as German soldiers would kill the poles if they were caught helping Jews or other “undesirables”, they would kill them including their whole family and even children/babies). and last, there were Jewish guards in Auschwitz too, does that make the Jewish community complicit somehow?